There's Something About Michiko: There's Something About: EASTER! What a great weekend! He is risen. That says it all. I could end my post right now. 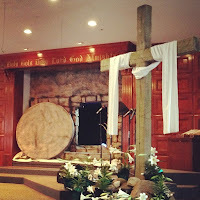 This was what we saw at church on Easter Sunday! But, I won't, because we had a BUSY weekend. And who else would I tell? Plus, there's always plenty to do around here, so always lots to say. Saturday, we went to my father-in-law's house and celebrated his and his wife's birthdays. We also colored some Easter eggs with the kids. They did a scavenger hunt and had a great time. And the weather was nice enough, they spent most of their time outside. I think Spring has finally figured out that we would all like some warmer weather! Sunday we got up to see what the Easter bunny brought - candy and kites - and where he hid the eggs. Or is it a she? That's been the frequently asked question this past week. If you know the answer, please enlighten me. Then all dressed up for church. Every Easter my husband sets the tripod up outside so we can take a nice family photo before we leave. It's kind of become our little tradition. And a great way to get a family pic every year! Buzz ordered the same thing as Daddy - mussels, clams and shrimp over linguine - and finished before Daddy, too! He really loves seafood. I hope everyone had a wonderful Easter weekend. Maybe next weekend I can relax, but who am I kidding? Beautiful family picture! Love it. Beautiful family pic!! Looks like you guys had such a good Easter. So glad you had such a wonderful Easter! 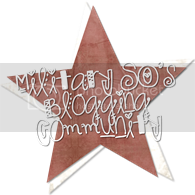 Following from the TGIF Blog Hop. Hope you have a great evening!